Follow us on the Sustainable Oakland Facebook page for information on volunteer events and sustainability news. Quick links: Go right to the information you need by clicking on the links below, or scroll down the page for all information. 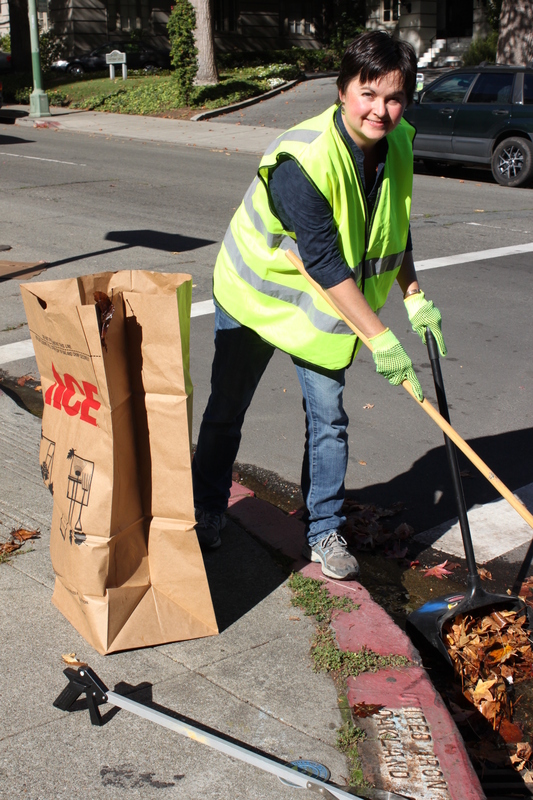 Oakland's award-winning Adopt a Spot program supports individuals, neighborhood groups, civic organizations, and businesses in ongoing cleaning and greening of parks, creeks, shorelines, storm drains, streets, trails, and other public spaces. Volunteers have adopted hundreds of sites around Oakland. Public Works can provide tool loans, debris collection services, and technical assistance. *Please note: These forms work best with Google Chrome. Do not use Internet Explorer. Oakland tallies all the litter removed by volunteers in an annual water quality report to the State of California. 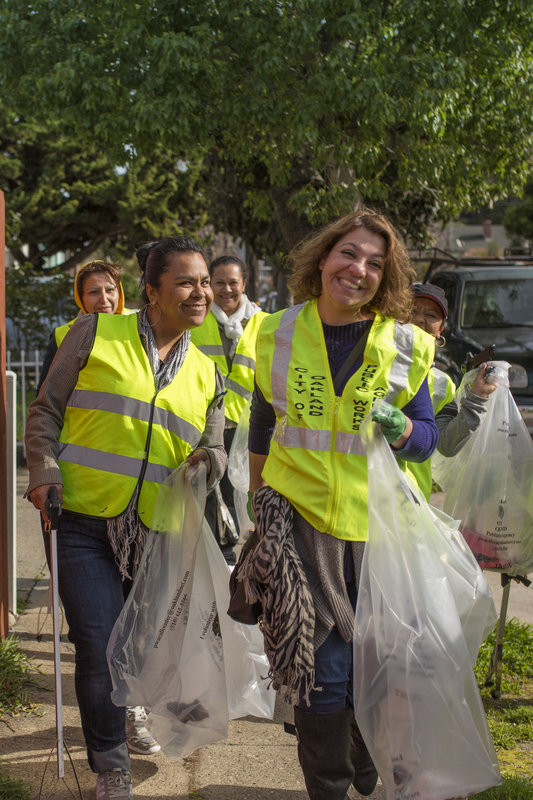 Volunteer cleanups are critical to keeping the City clean, and your data is critical to our understanding of litter and all that is required to clean Oakland. We also track other efforts such as habitat restoration, public art installations, volunteer planning, etc. Your reports on activities and accomplishments help us tell the volunteer story and improve event coordination. To enter volunteer hours and other workday results, please go to the Track It Forward website and find for your site(s) in the first drop down menu. Contact adoptaspot@oaklandca.gov for help listing your site(s) or other support. Free downloads for the Track It Forward mobile are available from these links for Google Play (Android) or iTunes Store (iPhone). To use the mobile app, you will also need to create a free account with a password or contact adoptaspot@oaklandca.gov for assistance. Oakland Public Works coordinates three city-wide volunteer events each year involving thousands of participants. Groups and individuals of all ages and abilities are invited to join cleanup and habitat restoration projects at creeks, parks, and neighborhood sites throughout Oakland. Projects include trash removal, habitat restoration, tree planting, and beautification. All tools are provided by Oakland Public Works. MLK Day of Service is held on the third Monday in January. Mark you calendar for Monday, January 21, 2019. Learn more and register at www.oaklandnet.com/mlkday. Earth Day is typically held the third Saturday in April. Mark your calendar for Saturday, April 20, 2019! Learn more and register at www.oaklandearthday.org. Creek to Bay Day is held the third Saturday in September. Mark your calendar for Saturday, September 21, 2019! Learn more and register at www.oaklandcreektobay.org. Our online Volunteer Event Calendar lists ongoing cleaning, greening, and beautifying efforts. Contact adoptaspot@oaklandca.gov to post your event. We also support one-time community cleanups. If you would like to host one, please contact us at adoptaspot@oaklandca.gov or (510) 238-7630. We may be able to provide you with tools, post-event debris collection services, and other logistical support. 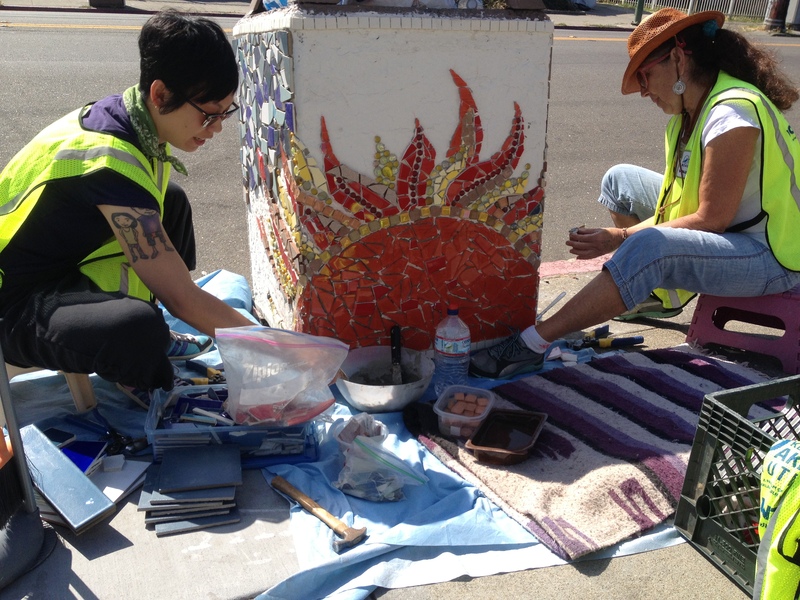 Oakland volunteers add beauty and character to the streets by adopting and adorning city-owned litter containers with tile mosaics and painted murals. See http://oaklandwiki.org/Mosaic_Tile_Trash_Cans for examples of some of these projects. If you would like to adopt a litter container or paint a mural on a utility box or other public space, please complete the Adopt a Spot form (do not use Explorer for this form, works best with Google Chrome) with a description or drawing of the art to be installed. Once your application is approved you can begin work on the project. Here is a video that shows you how it's done http://www.youtube.com/watch?v=TCL4I7shWx8. Hundreds of volunteers across Oakland have adopted storm drains to help their neighborhoods prepare for rainstorms. It doesn't take much to keep a storm drain clear. A little volunteer effort goes a long way in helping Public Works maintain over 12,000 storm drains to reduce flooding and prevent pollution of our waterways. When you sign up to Adopt a Drain, you become eligible to borrow City tools and supplies, and you will receive the City's rain alert notifications. Click here for other rain storm preparedness tips. 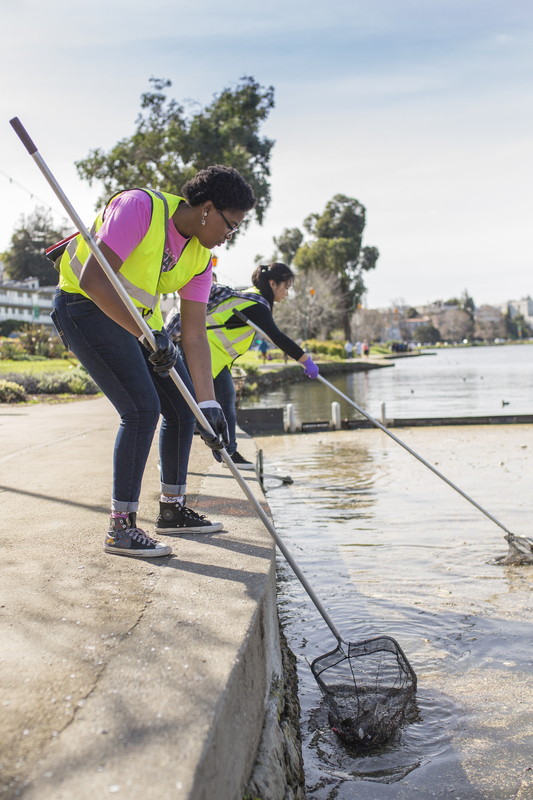 Oakland's Clean Lake Initiative supports volunteer cleanup, maintenance, monitoring, and education at Lake Merritt. For information on how you can participate in these efforts, please contact the Lake Merritt Institute at lmi@netwiz.net or (510) 238-2290. The Friends of the Gardens at Lake Merritt host regular volunteer events. Friends of Sausal Creek has regular volunteer opportunities in the Sausal Creek Watershed, including cleanups, habitat restoration, and plant propagation events. Keep Oakland Beautiful and the Oakland Parks and Recreation Foundation promote and support volunteer cleaning and greening throughout Oakland. Follow us on the Sustainable Oakland Facebook page for information on volunteer events, news on sustainability, going green and more! Daffodil Days: Every fall, Keep Oakland Beautiful provides free daffodil bulbs to volunteers willing to plant and maintain them in publically visible locations in Oakland. Plantings should be pre-approved by the land owner. Click here for more information and to access the application. Small Grant Program: Small grants up to $800 are distributed by KOB to volunteers on a competitive basis for projects that clean and green Oakland parks, creeks, streets, and other projects in the public right of way. Click here for more information. Oakland Department of Transportation is accepting applications through November 30, 2017 for temporary street murals. Streets murals can brighten and represent a neighborhood, strengthen community spirit, and reduce speeding traffic. Visit https://www.oaklandca.gov/services/dot/paint-the-town for more information and to apply. The Adopt a Spot Program received the 2013 Sustainability Practices Award from the Northern California Chapter of the American Public Works Association. This award is given to "individuals, teams or organization that have made an outstanding contribution to promote sustainability in public works." We thank the many individual volunteers, neighborhood groups, civic organizations and businesses who are cleaning, greening and beautifying adopted spots around Oakland. These efforts contribute to a cleaner, healthier, more beautiful, livable and sustainable City. Together, through Adopt a Spot, we're building community, raising environmental consciousness and participation, improving the quality of life in Oakland while also supporting broader regional and global environmental initiatives. To obtain accessibility information or to request a sign language interpreter or any other disability-related accommodation, please contact adoptaspot@oaklandca.gov or call (510) 238-7630, or TTY (510) 238-3254 at least three business days in advance. Please refrain from wearing scented products to volunteer events.